Product #11617 | SKU 8-125-0009 | 0.0 (no ratings yet) Thanks for your rating! 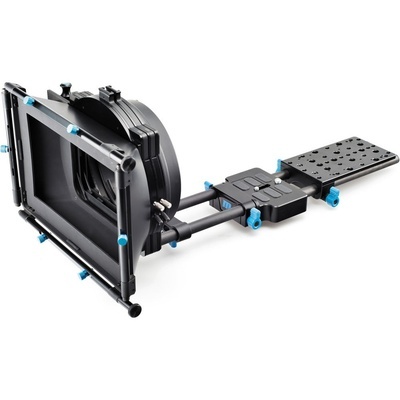 The microMatteBox Deluxe Bundle delivers light and flare control in a full-size cinema style mattebox, complete with flag, sidewings, and swing-away arm. The award-winning microFollowFocus enables precise and repeatable focus for your lenses. For RED Scarlet and Epic, the lowBase support plate results in a slightly higher rail-to-center-of-lens measurement. Most follow focuses can adapt to this height, and the microMatteBox requires the mattebox vertical adjustment riser accessory. Other third- party products may or may not adapt for use with the lowBase. Please note: Camera, lens, and third party accessories pictured are not included.